Copyright: © 2017 Prenam H, et al. This is an open-access article distributed under the terms of the Creative Commons Attribution License, which permits unrestricted use, distribution, and reproduction in any medium, provided the original author and source are credited. Myositis ossificans (MO), ectopic ossification, occurs in muscles and soft tissue including subcutaneous fat, tendons, and nerves. It occurs as a result of trauma, and affects more young people. 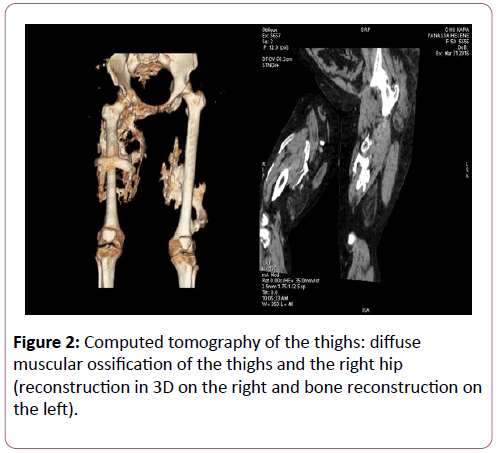 We present a case of MO in a 55-year-old female, without any trauma occurring, admitted for painful tumefaction of thighs evolving since two years. The diagnosis of was performed by X-ray and CT scan which shows multiple muscular ossifications of the thighs and the right hip. The biopsy confirmed this diagnosis. In the absence of trauma and according to the clinical context, imaging is a primary tool for the diagnosis of MO. Myositis ossificans (MO) is a heterotopic ossification characterized by the occurrence of bone formation in a soft tissue, usually muscular. It can be hereditary or not [1,2]. Classic hereditary form (myositis ossificans progressiva) is caused by a recurrent activating mutation (617G>A; R206H) in the gene ACVR1/ALK2 encoding Activin A receptor type I/Activin-like kinase 2, a bone morphogenetic protein (BMP) type I receptor [3,4]. Thus, the developpement of small molecule ALK2 inhibitors to suppress BMP signaling will represent an effective treatment for myositis ossificans progressiva [5-7]. Non-hereditary forms are usually posttraumatic and well-trauma there occurs a tissue necrosis or bleeding initiating an uncontrolled vascular and fibroblastic activity resulting with bone formation [10,11]. Factors associated with development of MO traumatica include the severity of a contusion, continuing exercise after injury, massaging the injured area, applying local heat, and head injury . Clinical signs are not specific and imaging haves a key role in diagnosis . The diagnosis of MO can be confirmed by histology [2,14].circumscribed lesion that frequently complicates hematoma formation of the muscles, particularly of the proximal extremities [8,9]. It is believed that after a distinguishable trauma there occurs a tissue necrosis or bleeding initiating an uncontrolled vascular and fibroblastic activity resulting with bone formation [10,11]. Factors associated with development of MO traumatica include the severity of a contusion, continuing exercise after injury, massaging the injured area, applying local heat, and head injury . Clinical signs are not specific and imaging haves a key role in diagnosis . The diagnosis of MO can be confirmed by histology [2,14]. We report the case of a particular form of non-traumatic MO in a West African woman. A 55-year-old female with no particular family history or trauma has consulted for pain and swelling of the thighs evolving for two years. Walking and seating were gradually limited. There was no peripheral joint pain, and no general condition. Physical examination revealed a tumefaction of the thighs predominating right and induration zones on the middle third of the thighs. There was hypochromic microcytic anemia at 11.2 g/dl and the erythrocyte sedimentation rate was 97 mm at the first hour. X-ray (Figure 1) and CT scan (Figure 2) of the thighs showed massive ossifications of soft tissues, spanning the right hip. 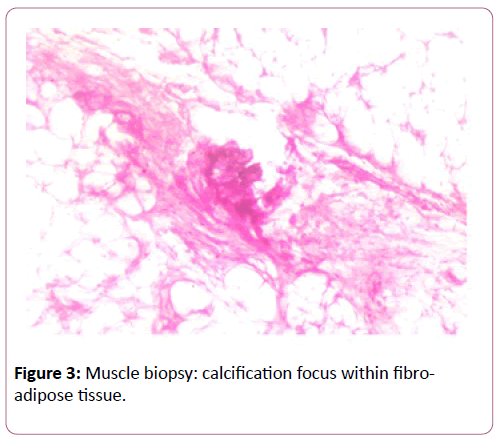 A muscle biopsy noted a focus of calcification within a fibro-adipose tissue (Figure 3). The patient was given analgesics and corticosteroids, which led to a modest regression of pain. Surgery was not considered because of the extended nature of ossification. Figure 1: X-ray of the right thigh showing a large calcifications of soft tissues. Figure 2: Computed tomography of the thighs: diffuse muscular ossification of the thighs and the right hip (reconstruction in 3D on the right and bone reconstruction on the left). Figure 3: Muscle biopsy: calcification focus within fibro-adipose tissue. MO is a rare non-neoplastic condition characterized by heterotopic ossification of soft tissues. Myositis ossificans progressiva occurs at an earlier age and some cases have been described in sub-Saharan Africa [15-17]. Although trauma is found in 60 to 75% of cases , there are also non-traumatic forms such as the case of our patient. MO non-traumatica can be seen at any age and the lesion is often well circumscribed [11,18-21]. Localization of MO on thighs and hips is frequent and increases with age [22-25]. The case of our patient is rare because, the ossification is bilateral and involves several muscles. This situation did not allow us to consider surgery, which is useful in some circumscribed forms [19,20,25,26]. Clinical symptomatology (joint swelling and stiffness, nodules) may simulate rheumatoid arthritis  or ankylosing spondylitis  in some cases. Imaging is the key to diagnosis. Ultrasonography and Magnetic Resonance Imaging are useful in the acute phase of symptomatology even before the appearance of calcifications [13,24]. CT scan with 3D reconstruction shows better the ossification as it was seen for our patient . The histology varies according to the degree of cellular maturation, but it can sometimes (at the early stage) be misleading and simulate an osteosarcoma [14,30]. In this case the lesion is extremely painful with a high level of alkaline phosphatase and there is no well-circumscribed appearance of the former on histopathology. Myositis ossificans is a self-limiting, benign ossifying lesion that can affect any type of soft tissue. Diagnosis is based on clinical and imaging, and should be done early to limit the often associated functional disability. Orcel P (2016) 61es Journées du Centre Viggo Petersen. L’actualité rhumatologique. Rhumatos 13: 187. Walczak BE, Johnson CN, Howe BM (2015) Myositis Ossificans. J Am Acad Orthop Surg 23: 612-622. Pignolo RJ, Shore EM, Kaplan FS (2011) Fibrodysplasia Ossificans Progressiva: Clinical and Genetic Aspects. Orphanet J Rare Dis 6: 80. 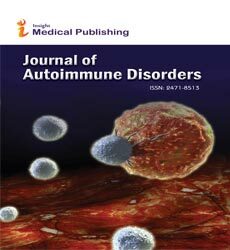 Katagiri T (2016) Fibrodysplasia ossificans progressiva and osteoimmunology. Clin Calcium 26: 691-698. Luo Y, Alsamarah A, Zhang K, Hao J (2016) Development of New Therapeutic Agents for Fibrodysplasia Ossificans Progressiva. Curr Mol Med 16: 4-11. Pignolo RJ, Shore EM, Kaplan FS (2013) Fibrodysplasia ossificans progressiva: diagnosis, management, and therapeutic horizons. Pediatr Endocrinol Rev 2: 437-448. Yadin D, Knaus P, Mueller TD (2016) Structural insights into BMP receptors: Specificity, activation and inhibition. Cytokine Growth Factor Rev 27: 13-34. Parikh J, Hyare H, Saifuddin A (2002) The imaging features of post-traumatic myositis ossificans, with emphasis on MRI. Clin Radiol 57: 1058-1066. Hendifar AE, Johnson D, Arkfeld DG (2005) Myositis ossificans: A case report. Arthritis Rheum 53: 793-795. Beiner JM, Jokl P (2002) Muscle contusion injury and myositis ossificans traumatica. Clin Orthop Relat Res 403: S110-S119. Taam I, Boussouni K, Redouane B, Amil T, Saouab R (2016) La myosite osssifiante circonscrite, une localisation ihnabituelle- à propos d’un cas et revue de la littérature. Pan Afr Med J 24: 71. Rothwell AG (1982) Quadriceps Hematoma. A prospective clinical study. Clin Orthop Relat Res 171: 97-103. Lacout A, Jarraya M, Marcy PY, Thariat J, Carlier RY (2012) Myositis ossificans imaging: keys to successful diagnosis. Indian J Radiol Imaging 22: 35-39. Sumiyoshi K, Tsuneyoshi M, Enjoji M (1985) Myositis ossificans. A clinicopathologic study of 21 cases. Acta Pathol Jpn 35: 1109-1122. Scott C, Urban M, Arendse R, Dandara C, Beighton P (2011) Fibrodysplasia ossificans progressiva in South Africa : difficulties in management in a developping country. J Clin Rheumatol 17: 37-41. Traore M, Traore Thomas J, Guinto CO, Traore S (2004) Fibrodysplasia ossificans progressiva in a Malian boy of Bamako. Clin Rheumatol 23: 527-529. Ele PU, Ofiaeli RO (1994) Myositis ossificans progressiva : from Nigeria. Trop Doct 24: 13-14. Li PF, Lin ZL, Pang ZH (2016) Non-traumatic myositis ossificans circumscripta at elbow joint in a 9-year old child. Chin J Traumatol 19: 122–124. Simmonds J, Taki N, Chilton I, Vecchiotti M (2016) A rare case of pediatric Nontraumatic Myositis Ossificans in the posterior triangle. Int J Pediatr Otorhinolaryngol 84: 116-118. Oc Y, Ozcan MS, Sezer HB, Kilinc BE, Eren OT (2016) Nontraumatic Myositis Ossificans of Hip: A Case Presentation. Case Rep Orthop 2016: 1982656. Nishio J, Nabeshima K, Iwasaki H, Naito M (2010) Non-traumatic myositis ossificans mimicking a malignant neoplasm in an 83-year-old woman: a case report. J Med Case Rep 4: 270. Connor JM, Evans DA (1982) Fibrodysplasia ossificans progressiva. The clinical features and natural history of 34 patients. J Bone Surg Br 64: 76-83. Talbi S, Aradoini N, El Mezouar I, Abourazzak FE, Harzy T (2016) Myositis ossificans progressive: case report. Pan Afr Med J 24: 264. Lee KR, So, Park Y, Jin W, Won KY (2016) MR imaging and ultrasonography findings of early myositis ossificans: a case report. Skeletal Radiology 45: 1413-1417. Srikanth IM, Vishal A, Kiran KR (2015) Myositis Ossificans of Rectus Femoris: A Rare Case Report. J Orthop Case Rep 5: 92-94. Ferreira C, Gomes C, Melo A, Tenreiro N, Pinto B, et al. (2017) Heterotopic mesenteric and abdominal wall ossification- Two case reports in one institution. Int J Surg Case Rep 37: 22-25. ÂÃÂ±klÃÂ± G, Akyol L, Uçak SS, Aslan K, Özgen M, et al. (2017) Heterotopic ossification (myositis ossificans progressiva): A condition interfering with rheumatic disease. Eur J Rheumatol 4: 79-80. Elloumi M, Fourati H, Ezeddine M, Baklouti S (2006) Myositis ossificans progressiva mimicking ankylosing spondylitis (a case report). Joint Bone Spine 73: 570-571. Â A, Walecki J (2014) Computed Tomography in the Diagnosis of Myositis Ossificans – Case Report. Pol J Radiol 79: 296-298. Yamaga K, Kobayashi E, Kubota D, Setsu N, Tanaka Y, et al. (2015) Pediatric myositis ossificans mimicking osteosarcoma. Pediatr Int 57: 996-999.